Our spacious garden style 2 bedroom, 2 bathroom, fully furnished condo is the perfect destination for an affordable family vacation. The immaculate accommodations are centrally located within a short walk of all the Sea Colony Resort amenities, including an outdoor pool 100 feet from the front door. The non-smoking condo has a fireplace and large deck, free high-speed wireless Internet access and is located on the ground level of a two-story building with ample unreserved parking. The unit sleeps up to 6 people; with a queen in the master bedroom, a twin over full bunk bed with a twin trundle bed in 2nd bedroom and a queen sleeper sofa in the living room. The 1/2 mile long private guarded beach is a short 15-minute walk from the unit, about 3/4 of a mile. During the peak summer season, guests can hop on the shuttle bus or tram that runs back and forth to the beach. If the private beach and 12 swimming pools (2 indoor) weren't enough, Sea Colony offers world-class tennis facilities, 34 courts (6 indoor), a state of the art fitness center with gym, workout equipment, 2 pools and snack bar. In addition, Sea Colony organizes a wide variety of recreation and entertainment programs for different ages throughout the summer. The Sea Colony Beach & Tennis Resort is located in the quaint town of Bethany Beach, Delaware and is within a 3-hour drive of Washington, Baltimore, & Philadelphia. The resort is currently ranked in the top 50 overall and number 13 for tennis camps in the world by Tennis Resorts Online. Among Tennis.com's Top 50 Best Tennis Resorts in the US list and No. 3 Tennis Resort in the Mid-Atlantic Region. Recipient of the 2012 USTA Outstanding Facility Award. We're a family of five (Dad, Mom, and 3 girls) from Leesburg, Virginia. We've been coming to the beach for years and have owned this condo since 1998. We love the beach and all the amenties that Sea Colony and the town of Bethany Beach have to offer. The condo is the perfect location for an affordable and very comfortable family vacation. Even with all the amentiies its easy to just relax and unwind at the beach or in a lounge chair beside the pool. Sea Colony offers a wide variety of summer recreational activities and events for all ages. From the 1/2 mile private beach to the outdoor and indoor pools, the Fitness and Tennis Centers. Transportation to and from the beach is offered daily from early June thru Labor day. Pillows, comforters, and extra blankets provided for all beds and the sleeper sofa. Guests must supply their own linens and towels. Approximately 3/4 of a mile from the private Sea Colony Beach. About 15 minute walk or take the seasonally provided transportation to and from the beach. 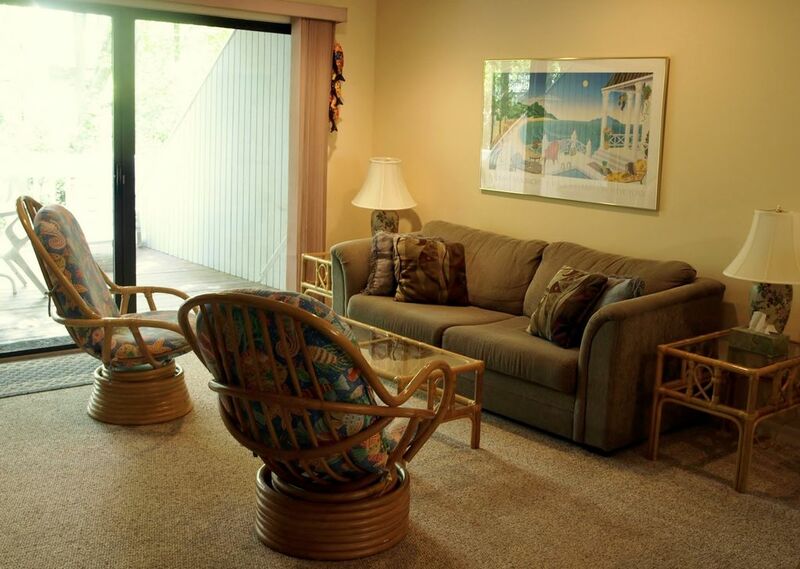 Condo unit located in the Sea Colony Beach & Tennis Resort, approx 3/4 of a mile from the beach. Beach transportation included from early June thru Labor Day. Outdoor pool just steps from the unit. Local calls only. Long distance requires credit or calling card. Ample parking in front of unit. Dining table has an extension and seats six comfortably. 2 flat screen LED TVs. One in the living room and one in the master bedroom. With deck furniture - backs to trees. Sea Colony Tennis Center with 6 indoor courts. Full tennis program with lessons and arranged matches. There are 4 stair steps leading into into the 1st floor entrance of the unit from the parking lot. 2 saunas located at fitness center and the Edgewater indoor pool. 2 hotubs located on Sea Colony property - one at fitness center and one at the Edgewater indoor pool. Our family had a great vacation. Great place. Great people to rent from. We used to stay here years ago when we lived in Maryland and were happy to learn that it's still available. The Homas are still the great hosts they always were. The condo is much like we remember but with updates and upgrades. Same great location. Same great feeling when staying here. Hoping we'll have a chance to come back soon. We had a fantastic family vacation staying at the Homa's vacation home. It was neat and clean and had all the amenities you would need during your stay. It is close to the beach restaurants and the Sea Colony community is very peaceful. We highly recommend this home. I've been going to this beach condo with my family for many years. We love the new freeman pool center and the location; just a 10 minute walk to the beach! The condo is decorated nicely and I especially love the bunk beds. The owner is helpful and responds in less than a day. I highly recommend this lovely beach condo. Thank you for your positive feedback! We certainly hope that all our guests enjoy, as much as our own family does, all that the condo and Sea Colony have to offer. Thanks! Perfect Bethany Beach Vacation Spot! The property was all we had hoped for. It was clean, nicely furnished and well decorated. The location was great, a nice walk to anywhere in the complex you wanted to go. The only thing I was disappointed about was there were no outdoor hot tubs :-( Everything else was perfect, unit was nicely stocked with kitchen stuff (pots, pans, etc), washer & dryer worked perfectly, showers had enough water pressure, port a crib worked wonderfully...like I said, everything we had hoped for! Thank you for the positive feedback! We've tried to make the condo a comfortable home away from home not only for our guests to enjoy but for our own family. Thanks! The beaches of Sea Colony offer more than just sunbathing. Featuring several oceanfront pools with complimentary chairs and umbrellas, the Sea Colony beaches are also a source of activities and entertainment like beach games, contests and weekly bonfires. The highlight of the Sea Colony Tennis Community is its world-class tennis facility, featuring a wide variety of courts and activities, as well as professional tennis instructors. Active types will also be drawn to outdoor adventure on the area’s lakes. Programs such as Club Sea Colony and Kids Night Out offer games, supervised swimming and many other activities presented in a camp-style format, making Sea Colony a family-friendly destination and a great escape for all ages. Additional Sea Colony Recreation Fee (per person ages 4 and older) is paid to Sea Colony at check-in: $40/person/week in peak season (Jun-Aug) $20/person/week in early/late-season (May, Sep) $12/person in off-season (Oct-Apr) While the unit is very nicely furnished for a comfortable family vacation we do require that quests supply their own bed linens and towels.